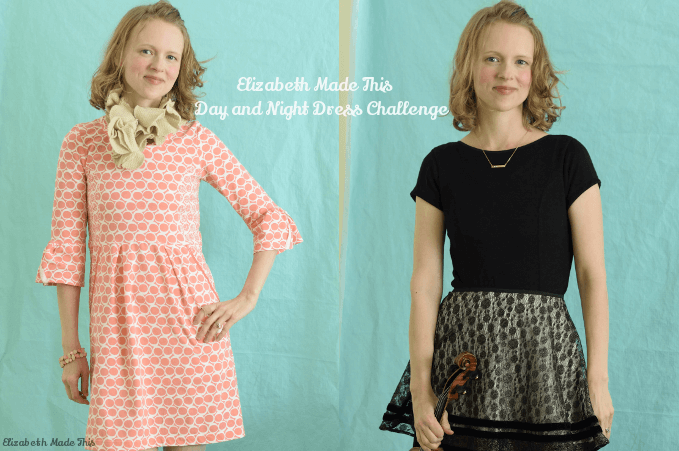 Day and Night Dress Challenge Bloggers revealed!!!!!!! 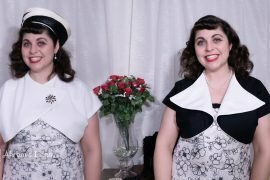 Day and Night Dress Challenge Prizes! Both of your dresses are lovely, Elizabeth! I especially like the stitching detail you added to your day dress and the overlay for the night dress- it really changes the look and makes a third look! Thanks Meg. I loved adding the embroidery, and variability was just what I wanted out of the overlay. I’m looking forward to seeing your projects as well! That night look is also stunning! I love how it’s an interchangeable look and it’s so chic! I’m imagining taking that lace circle skirt and wearing that with a fitted top and leggings to bring it to a day look. I’d probably throw on some combat boots with it but I’m a little crazy, LOL. Thanks Rachel! Embroidery really is so good for adding depth on fabric. It’s a deep rabbit hole, but an enjoyable one. I’m going to check out that book that you bought. I would totally wear the lace skirt with leggings…I’ll have to find the right color since I don’t really wear black…I like the idea of combat boots–a little punk, no? Lace with a side of Green Day. 😀 Chokers look amazing on women! Why did they ever go out? 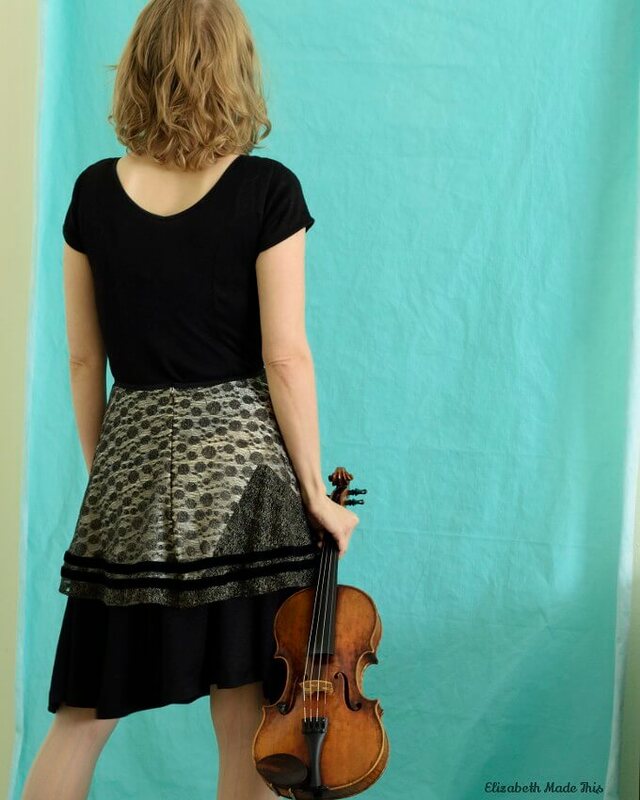 My violin teacher growing up totally wore combat boots (nay, now that I think about it, I’ve known a crap ton of Doc Martens wearing violinists) while performing. 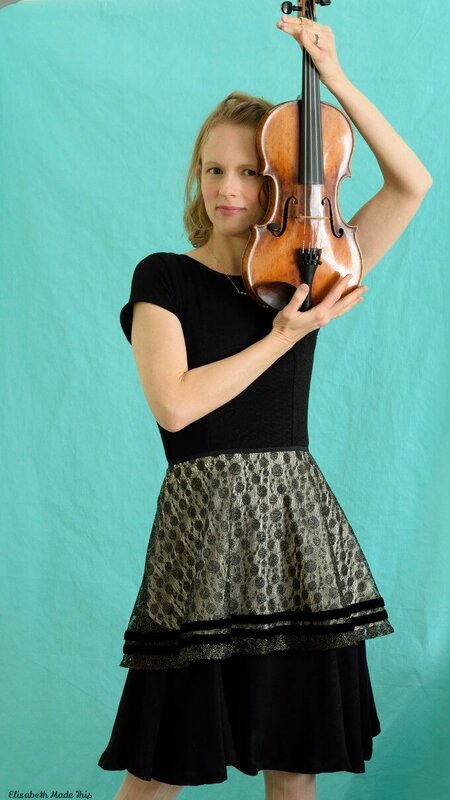 I have a soft spot for that look, though I’d be the one who biffed it and fell on her violin. I love both dresses! 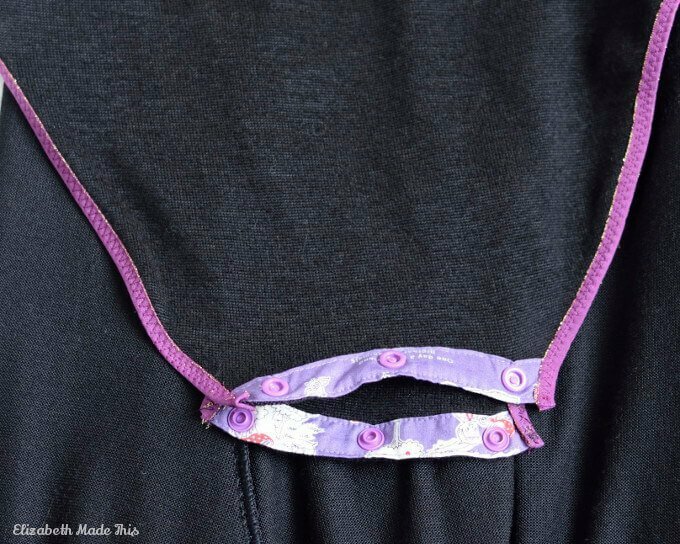 I especially like the embroidery you added to the day dress and the clever zippers. That night dress overlay is so cool. What a great way to change the look of a simple dress! And I love that lace. Thanks! Your my lace sister Linda! I keep asking the question, how much lace do I actually need in my wardrobe? My conclusion–I’ll stop adding lace when I stop finding cool lace to work with. I’m looking forward to all of the pictures of your dresses! Elizabeth, your dresses are fantastic! I agree with the comments, the zipper detail is so smart. I also like the night dress and how many variations you have by just adding those lovely pieces. Thanks Daniela! I was glad the zipper worked out just as I had it in my head. And the concept of wardrobe sudoku is real–extra pieces really do mix and match in ways you wouldn’t normally think of if you just have them available to do so. I’m looking forward to your Victoria B dress!! Love both dresses and the music. Your night dress can be worn to many functions. Your day dress is fun with the added zipper. Thank you Nancy! Adding the music was really fun. I really enjoyed making both dresses as well. Thanks Judith! You’d always be welcome here in CO.
You did a wonderful job with your day/night dresses and this is a wonderful challenge too! The coral dress is SO flattering on you, and the zippered flounce is genius. I love it from a functionality standpoint, but I also just plain like the way it looks. The black dress is also beautiful. Thanks Masha! I love that color, and adding the zippers was a fun engineering problem. I still wish I could have participated in this challenge, but that’s life. Maybe the next time you run a challenge, I’ll be baby bump free and able to play along! Thanks Becky. I could see that across your back. Flute position is similar to violin in being asymmetrical on the body–it’d be hard to hold that with added tightness. And next time! A challenge will be something to look forward to after your guy is born. Great dresses. Both makes suits you well. The zipper details in the sleeve of the day dress is fun. Your transformations for the night dress are very clever. Thanks Sonja! It was a challenge to make a black dress that worked for me. Black is not a color I wear ever, so I decided to go for something my style since I couldn’t control the color. The zippers are my favorite part! 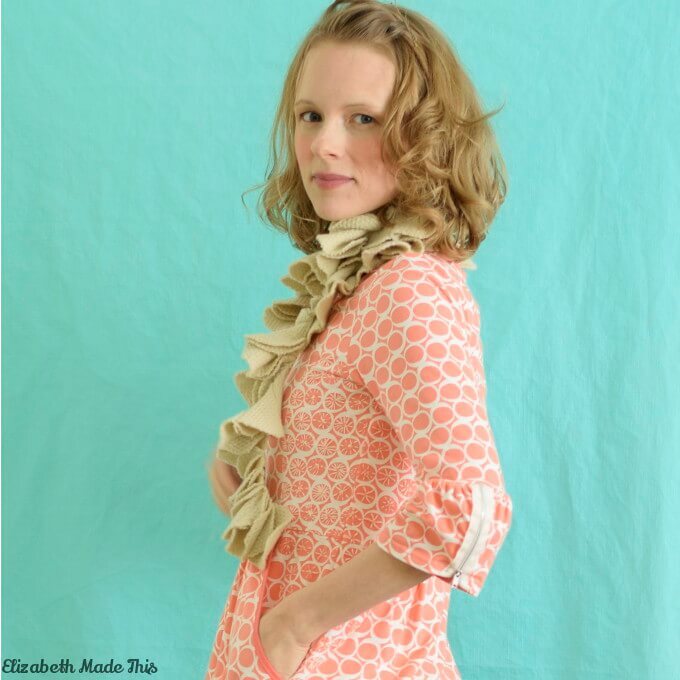 Elizabeth, you are so creative with your pattern hacks. I can’t decide which look I like more because they are both fantastic. Mind if I share it on PatternReview instagram? Thanks Deepika! Of course you may share! I love your dresses! 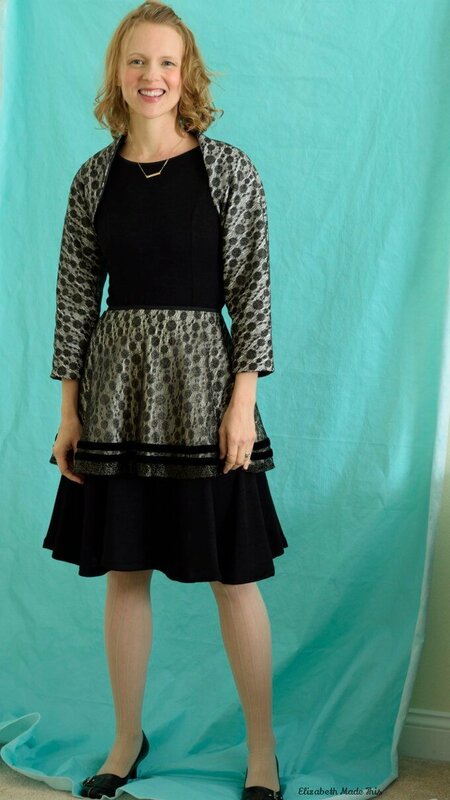 I used that Jalie pattern to make my last dance dress, since I like my dance dresses to have built in leotards and I hadn’t had the best of luck with the ones I drafted myself for previous dance dresses. First off, I found that the girth measurement was spot on. When I measured my girth I found that I needed 2 more inches than the pattern said for my size. I lengthened the torso front and back by an inch each and it fit absolutely perfect. But I have a question. The instructions didn’t have an option for a snap crotch and since I’ve never done one before, I just made the pattern as is, but I had planned on making my next dance dress with a snap crotch. What alterations did you need to do to the pattern to put in the snap crotch? I’d also be interested to see how the Kam snaps work out for you. I just got a tool and a set of snaps for Christmas, so I was thinking I would try them out. But I’d hate to have a wardrobe malfunction in the middle of my next competition! haha. I’ll probably make up a practice dress after my move is done and wear it to my lessons for a while to see if there are any issues before making a competition dress. I’m really curious about the Kam snaps too. They have more clutch power (to use a Lego term) than sew-on snaps, but I know snap tape does pretty well too. Ultimately, as long as you have the fit right, I don’t think they’ll be enough stress to pop anything. Still, it’s good to test out that one. 🙂 When do you need to have a competition dress by? My next competition is at the end of April, but I do have another event on February 19th. I’m literally in the middle of moving and I even delayed packing up some sewing projects thinking I’ll get a chance to work on them, but honestly, I have not had any free time at all and I don’t know if I will get a chance to sew anything up in time for the Feb. event. I might just rent a couple dresses for that and maybe I’ll have a chance to take in my purple dress since I’m down about 60 lbs since I made it. I’ll have to see how this next week goes. I don’t really have much experience with snap crotch garments. 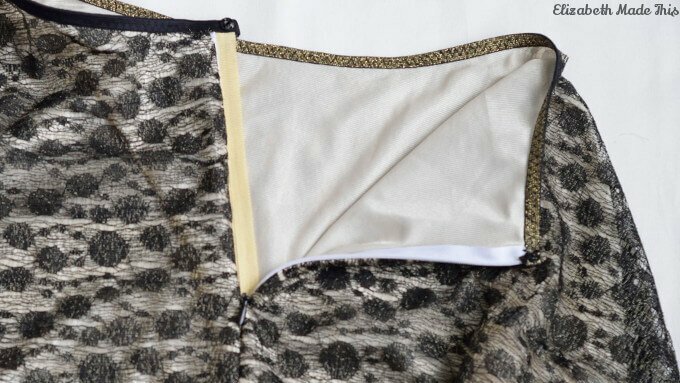 I was watching the Nettie bodysuit and considered buying it to use as a built in leotard, but then found the Jalie pattern. The only garments I’ve ever owned are foundation garments and they have hook and eye closures on the crotch. So, I was more or less thinking that would be the safest way to go. But certainly snaps seem easier to deal with. Although to be honest, at the competitions, I rarely get enough time to use the restroom and when I do, it’s usually only because it’s time to change dresses anyway. So, it’s not like it’s a huge priority. I need to remember to scope out the crotches of the dance dresses for sale at the events I go to and see how the pros do it. I’m usually too distracted by examining the bling to remember all the practical parts to look at. I’d be really curious to see what the closures look like on professional dresses. I’m finally getting round to having a look at what everyone else has produced! 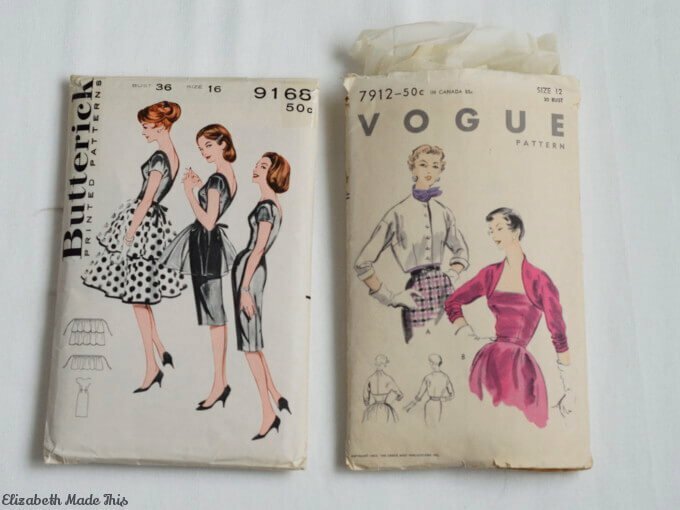 Now onto your dresses! Your day dress is cute! I don’t know if it’s appropriate calling someone older cute, but you definitely look so nice in it! It really suits and I love the two different fabrics you used, you can’t almost tell that they’re different, they work so well with each other! Your night dress is my fave, I’m not trying to take anything away from your day dress, that one is lovely, but this one is lovelier! If I ever sat to watch an orchestra play and I saw you there with your violin, your dress would definitely catch my eye. I really love how the whole outfit was orchestrated (hehe ;)) You did a great job with it! I wish I had played the intro…I wanted to, but I was pressed for time, and I couldn’t find a proper editing software in my turnaround time, so I went with some royalty free music that suited me. I’m seriously considering the YouTube bit. I see you and all the other ladies in the challenge who are doing that and I’m totally inspired. I’ve gotta do some more research about video editing. Thanks so much! I hope I’m 80 and people still call me cute, LOL! That’s about my favorite color, and I’m glad the night dress worked out exactly as I wanted it to. Using black is a major challenge for me as I don’t wear it. Yes yes! Join us! Video editing isn’t too difficult, it’s basically just cutting out the things you don’t want and leaving in the things you do. I use a Mac and the iMovie software, which is pretty basic and more than enough for me. I’m not sure on what would be best on a windows PC but I’m sure the girls will help you out! But the black suit you too. You definitely should be glad, it turned out PERFECT!